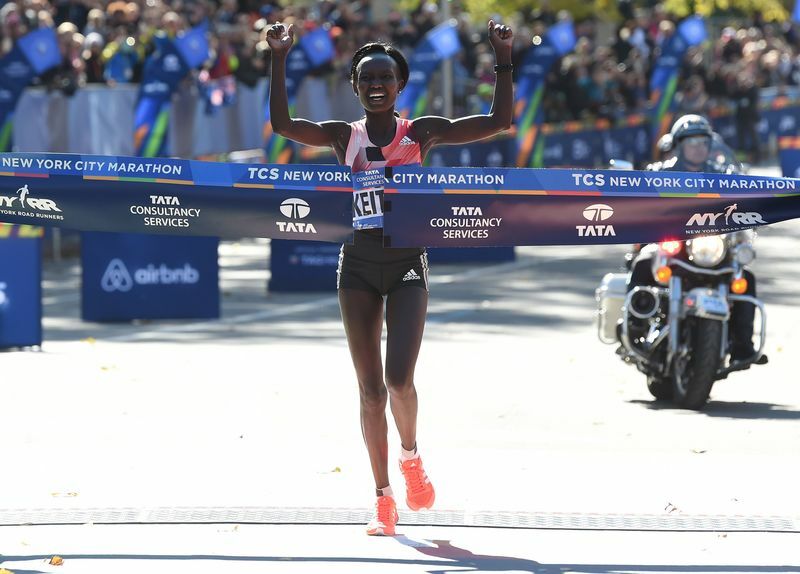 New York, Nov. Nov 5: Kenyan Geoffrey Kamworor won the Tata Consultancy Services (TCS)-sponsored New York City Marathon held Sunday under the heaviest security ever for the event in a metropolis, unfazed by the terror strike earlier this week. More than 51,000 runners from about 125 countries participated in the race officially known as the TCS-New York City Marathon, a major promotional event for the Indian tech giant. About 2.5 million spectators lined the 26.2-mile (42-kilometre) route snaking across all the five city districts. Kamworor finished at 2:10:53 in the marathon dominated by Africans. Fellow Kenyan Wilson Kipsang of Kenya came in second and Ethiopian Lelisa Desisa third. Kamworor had won the 2015 Beijing 10,000-metres and the Cardiff half-marathon last year. American Shalane Flanagan won the women's side of the marathon for the first time in 40 years. With a timing of 2:26:53, she outraced the three-time Kenyan woman champion, Mary Keitany. New York City police chief Carlos Gomez said the number of security personnel "will be the most deployed at this event" ever. At the starting point on Staten Island, runners were checked with metal detectors. Heavily armed police and National Guard troops were on alert along the route. Garbage trucks and trucks loaded with sand blocked off many intersections to prevent terrorist attacks using vehicles. Counter-terrorism commandos stood-by, snipers took positions on buildings, and bomb-sniffing dogs worked their way through some spots. New York City Mayor Bill de Blasio assured the city that the event of global importance in marathons will "be well protected." The marathon ended at the Central Park in Manhattan. A terrorist attack by an Islamic State sympathiser using a truck as a weapon killed eight people in Manhattan earlier this week. The attack allegedly by an Uzbek immigrant, Sayfullo Habibullaevic Saipov, near the site of the 9/11 terrorist strike in 2001 put the city on edge, especially because of an attack on the Boston Marathon. In 2013, two brothers from another former Soviet republic, Kyrgyzstan, had set off bombs made with pressure cookers at the Boston Marathon killing three people and injuring about 500. Along the route on Sunday, TCS logos and signs were displayed raising the visibility of the tech company in the city as well as reminding the city of community involvement by Indian companies operating in the US. Tata Sons Chariman Natarajan Chandrasekaran, an avid marathoner himself, was instrumental in getting TCS to sponsor the high-profile event when he was the CEO of TCS.